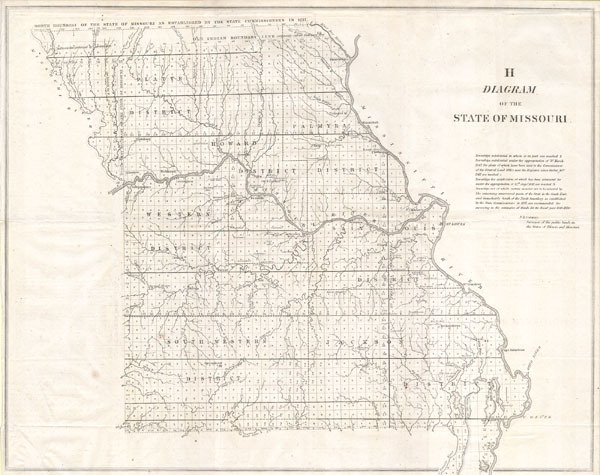 This magnificent map of Missouri was issued for the U.S. Land Survey Office under the supervision of F. R. Conway. It is officially entitled 'Diagram of the State of Missouri.' This large map reveals the state of Missouri in fair detail with special attention to rivers and waterways. Counties as they existed are labeled, as are mines, towns, and mineral deposits. An exceptional and rare early map of this region.